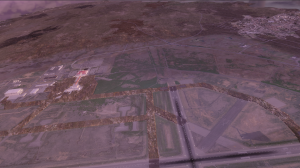 After years of FSX usage, I finally decided to do it… migrate from FSX to Prepar3d V3. Until last month I was very reluctant and skeptical to move to Prepar3d for different reasons. First of all, all my payware sceneries, aircrafts and tools have to be migrated. I was afraid about compatibility. 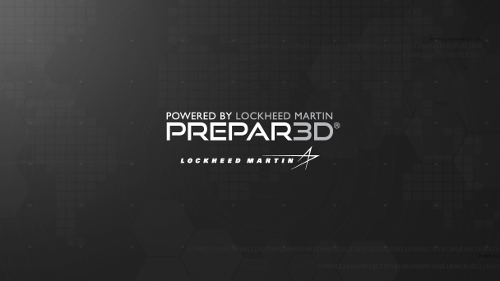 I already checked multiple times the “FSX TO PREPAR3D MIGRATION TOOL” that allow you to install FSX stuff in Prepar3d. Is that really working? What is the impact? will it be really compatible? The other reason was about “Out of Memory” issue. All people who have complex aircraft and scenery know this famous issue. Working in IT, I expected to wait the 64 bits version but by reading a lot of article on the web I realized it was not the priorities of Lockheed Martin. I was quite upset as it is a important question but I finally found a really good argument, and this is true. 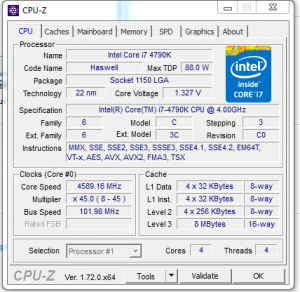 FSX is designed to work with old technology and mainly using CPU ressources and then… RAM. So if the new technology and LM can redesign the way P3D is using the ressources this could certainly fit the needs as well. If the app can manage the memory better, it will solve some OoO issues, even if a 64 application could manage more memory than the 4Gb of a 32 bits application anyway. Another point in case P3D become 64bits, for sure all add-on based on 32 bits will not work on a 64bits application…. So in term of compatibly, it is not good at all for people like me which have tons of add-ons. Well for sure I know that all my add-ons are not compatible and as money does not grow on a tree, I have to make some choices. well… I can keep my FSX on another SSD to still use them! 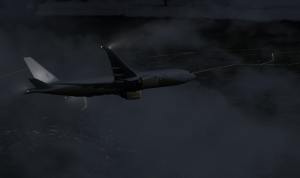 I think, the bigger regret I have is that the MD11 from PMDG is not compatible and WILL NOT working on P3d. This is not a part of their business plan to re-edit as they are concentrated on professional business (and most of the MD11 are being replaced by companies), so it make no sense to spend time on this (even if it does not mean that other developer could not develop a similar product!). So, my first step was to buy a Prepar3d license, at least to try. 2nd, reinstall “Windows 7” 64 bits on a fresh new SSD to start from zero. I will not explain all the steps here as there is already tons of good sites that explain this. After the Prepar3d installation (that works like a charm), here is the add-ons I started to install. Aerosoft AES IS NOT WORKING! This, surprised me… AES is not working with P3d (at least the day I’m writing this article). Hopefully I have a license for FSDT GSX 🙂 That work perfectly as well… I used to work with both as they have different way to work, depending the airport or aircraft. But using only GSX is fine enough for me. It is a very good product and the politic to work with all add-ons is very nice! REX Essential PLUS is working perfectly. REX – Soft Clouds is perfect! 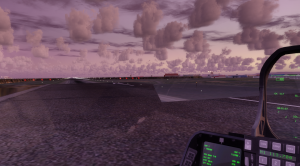 HIFI TECH – ACTIVE SKY NEXT is also designed for P3D, so… Perfect! Bye Bye ImagineSim. Except the most recent scenery (from ZSPD Shanghai Pudong), none of older are working (buildings are missing, FPS issues, etc…). I only be able to instal ZSPD. The rest will be not reinstalled. And I remember it was the same from FS9 to FSX… Well… I do not plan to buy any other license from them. Aerosoft sceneries. A lot of Sceneries have the installer updated and work perfectly. In case “FSX TO PREPAR3D MIGRATION TOOL” works perfectly for this! FlyTampa. Most of the FlyTampa product are working. In case of, request the FlyTampa support to get new download link for P3D (thank you FlyTampa for your quick support! Fantastic!). 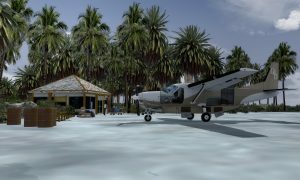 Unlike ImagineSim, most of scenery I have work perfectly with P3d (LatinVFR, Taxi2Gate, TropicalSim, Thai Creation, A_A SCENERIES, UK2000-<-are P3D already). either by copying the folder from FSX or by using “FSX TO PREPAR3D MIGRATION TOOL“. Even for FlyLogic (Lugano, Sion, Bern-Belp) products are working, except some details are missing (like the safety net does not show up in LSGS – Sion). 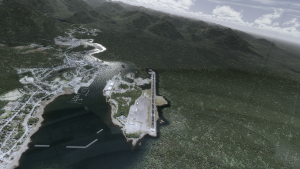 One issue I have is with Aerosoft/FSaddon Tongass Fjords. Some issue of compatibility with ORBX Global / Vector. 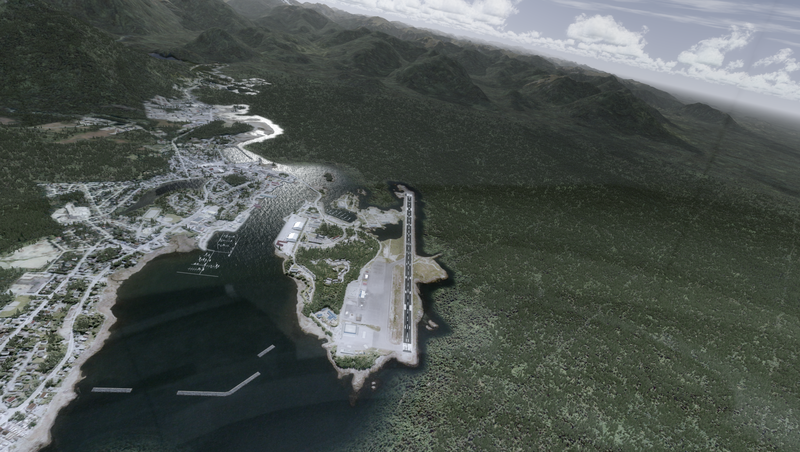 ( I see a big forest instead of water in PASI Sitka Rocky Gutierrez Airport). Read forums, change the priority, Tried to copy from FSX or install with migration tools, but still not able to make it work. 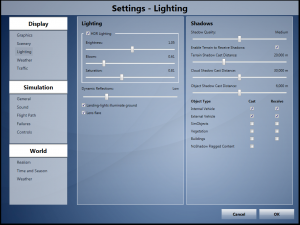 AEROSOFT – NIGHT ENVIRONMENT. are all designed for P3d, so great! Another good tool I’m using from years and works with P3d is Illbeback from José Oliveira. You can setup a feature like a “Pause at top of descent” for any aicraft. That pause your FS regarding the NM you entered (really useful for CaptainSim product!). FSFX Immersion, propose P3d version, and it works very well! Fraps. to take screenshot and video I use Fraps. It works well but the only thing, you MUST start fraps before P3D, otherwise it does not detect it. Simple Airport Scanner is a great utility that allow you to find multiple bgl file per airport and location. This is fantastic when you have issues with sceneries. As mentioned before, PMDG product need to be bought again… as I already have a lot of aircraft, I decided to buy only the B777-200 and 300. I owned the CaptainSim B777 but the FSX version is not compatible with P3d and need to be re-purchased. And personally, regarding the cost, I prefer spend my money on PMDG than CaptainSim. Regarding the 737, I would not purchase it right now (maybe later) but for a medium-haul flight I will fly with Aerosoft Airbus X product. MD11 is not compatible, J41 and B747 either. 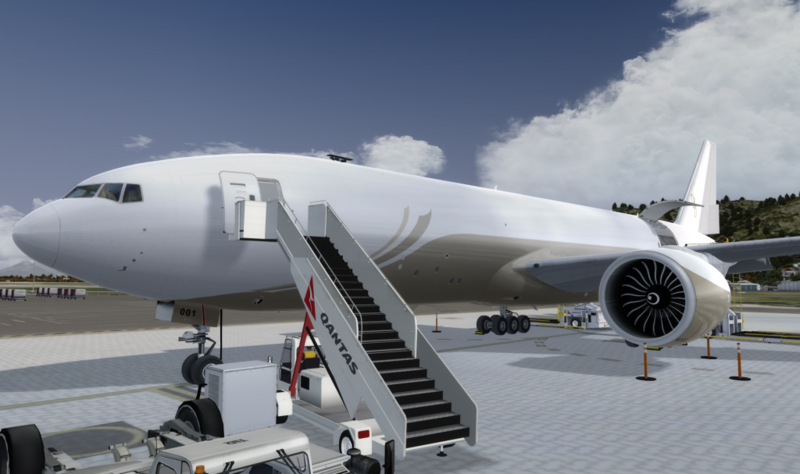 (PMDG is working on a new B747 version, I’m looking forward for this!). B757/767. I started to copy the aircraft from the FSX folder but I have a better result by installing with “FSX TO PREPAR3D MIGRATION TOOL“. Even if I still have some issue with it. 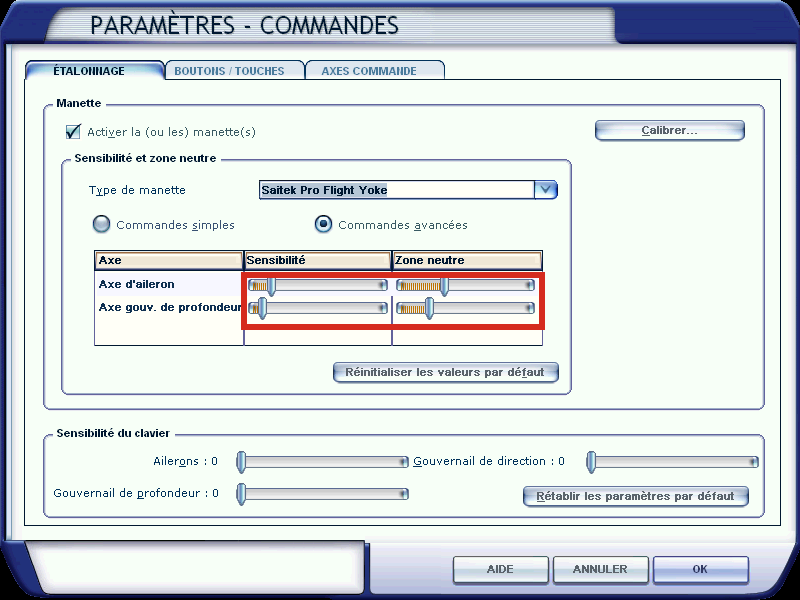 The TCAS considers the CaptainSim aircraft as trafic, you have a red point when activated. The b777 will be not replaced or installed. the C130 I have to try, maybe later. Level-D 767. Well… I love this bird but from my point of view, it does not fit the P3D graphic expectation anymore. C208, Cargomaster is working perfectly. So I keep it! Simcheck A300 + FMC upgrade. Need to be tested. Well… Long time ago, I tested P3d V1 and was not really convinced… but P3D… wouhaou… The graphics and performance are much better, the texture is smother. 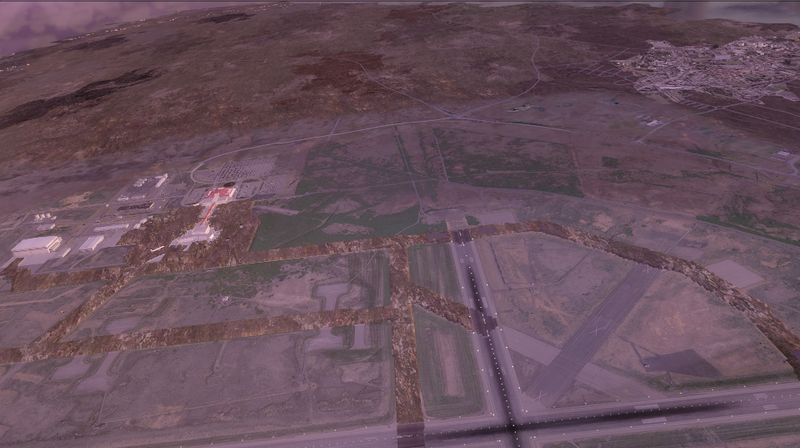 We can really manage the setting better without playing with the Prepar3D.cfg (new fsx.cfg in app data folder). When I start it for the first time, I was surprised by the color of the sky, the “blue” was more like a “grey-blue”. but by playing with the “Bloom” in lighting config, we can manage this very well. and the light… wouhaoo… this is just fantastic when the light of the sun is moving over the cockpit when you move. But here is just my overview about my first experience with P3D. note that the config I have, is what I “negotiate” with my configuration, it is not working on all config. The best is you to take time to try, retry, try again, retry again and again to find the better compromise (and even for me, now we can easily select a setting profile, I do not use the same profile whether I’m flying over Caribbean or over a big city like Chicago or New York). The option in P3D let to push a high level of details, definition, etc… So if you were put all the config to Max with P3d, you should not consider to drag all the settings to the right. As explained, you need to find a good balance with your hardware and your expectation. But again, the profile management let to manage that easily. And to be honest, I have taken the habit to restart my Flight Sim before the descent. I save my flight, and restart it. This is the best way to have a good quality without having the OoO message during the final. Maybe this few lines could help you to take your decision (or not ;-)). I recently had a lot of issue with the Autopilot of CaptainSim aircrafts (B757, B767, and even the B777). When I started the LNAV or HDG it stopped working after a tight turn and continuously flying in circle. what make me crazy after a lot time in CaptainSim’s forum to understand what happened. 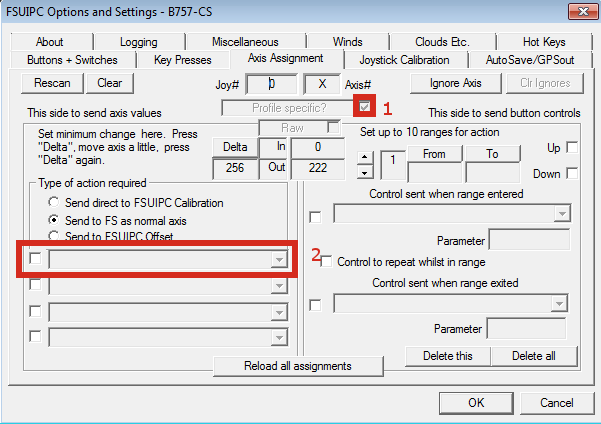 As I have multiple devices (Yoke and Joystick) I do not activate the Joystick in FS and use only FSUIPC to control my devices (and I removed any axis control from the FS control) . But with CaptainSim aircraft, it may appears a conflict between Yoke and Jostick and I realized that an issue of sensitivity could cause the issue as well. So… I finally activated the control of the joystick in FS control Center. But I have configured ONLY the Aileron Axis and Elevator axis from there and only for the yoke. All other controls for my other joystick are removed and only set in FSUIPC. Last point is configuring FSUIPC. 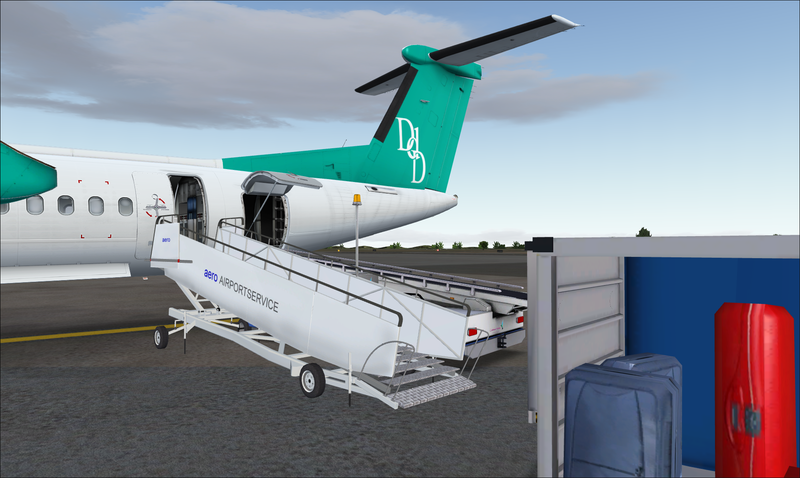 When you are parked with your CaptainSim aircraft at your favorite airport, start FSUIPC. Go to “Axis Assignment” and select “Profile Specific?” to activate the configuration ONLY for your current aircraft (what will not impact the configuration for your other aircraft). Then press Rescan for each Aileron Axis and Elevator axis , select “Send to FS as normal axis” and remove the control if any and let it blank. (check the FSUIPC manual in case you need more information) this will remove any conflict you could have with your CaptainSim aircraft and Joystick. Voilà… This resolved my AP LNAV and HDG issues with CaptainSim aircaft. I hope this will help you. When I flight with other birds, I uncheck the “Enable controller” from the FS Joystick Control Center.